As Brennan Tapped for CIA, Case of Somali Detainees Highlights Obama’s Embrace of Secret Renditions | Democracy Now! human rights investigator and director of the Equal Justice Forum. lawyer representing Mohamed Yusuf, one of three accused al-Shabab fighters who were detained secretly in Djibouti and interrogated before being brought to the United States for trial on terrorism charges. StoryJan 08, 20134 Years After Vow to Close Gitmo, Why Has Obama Signed NDAA Bill Barring Transfer of Its Prisoners? NERMEEN SHAIKH: We turn now to look at the use of torture and rendition techniques under the Obama administration in light of this week’s nomination of John Brennan as director of the CIA. Brennan, who is currently Obama’s top counterterrorism adviser, withdrew from consideration for the same position in 2008 amidst protests over his role at the agency under George W. Bush. Brennan had publicly supported the CIA’s policies of so-called “enhanced interrogation techniques” and extraordinary rendition. Brennan’s nomination comes as new details have emerged about a rendition story that has received little news attention. On the Friday before the Christmas long weekend, three European men of Somali descent appeared briefly in a New York courtroom. Two of them were from Sweden—Ali Yasin Ahmed and Mohamed Yusuf; the third man, Mahdi Hashi, was a longtime resident of Britain. Their whereabouts had been unknown for months. According to The Washington Post, the men were arrested in the East African country of Djibouti on a, quote, “murky pretext” in August. They were then questioned by U.S. interrogators before being secretly indicted by a U.S. grand jury and flown to the United States for trial. AMY GOODMAN: The men are accused of supporting the al-Shabab militia, which the U.S. considers a terrorist group despite admissions by U.S. officials that most fighters are not terrorists but simply fighters in Somalia’s civil war. Their appearance in a U.S. court offered new evidence about how President Obama has quietly continued the controversial practice known as rendition. To talk more about the significance of this case, we’re joined by two guests. Ephraim Savitt is a lawyer representing Mohamed Yusuf, one of the three accused men. And joining us via Democracy Now! videostream is Clara Gutteridge, the human rights investigator and director of the Equal Justice Forum. Let’s start with you, Clara. Talk about the significance of these three men, who they are, ending up in a New York court over the holidays. CLARA GUTTERIDGE: I think what these cases really show, above everything else, is that rendition is alive and kicking under the Obama administration. Over the past few years, there’s been an increasing focus on Obama’s use of targeted killing and the drone program, and we in the human rights community had really forgotten about rendition and secret detention. But what we can see from these cases is that—is that secret detention and rendition are absolutely ongoing, and it’s something that we really need to focus on. AMY GOODMAN: Who are they? Tell us who these three men are. CLARA GUTTERIDGE: I mean, in terms of describing who the men are, I think it’s far better for the lawyer to do that. But to my knowledge, these men were being detained incommunicado in Djibouti for several months without any access to lawyers or to any kind of due process. And when there started to be some media focus on the fact of their disappearance and detention, what then happened was that they were whisked to the United States. They were rendered there with no judicial oversight and brought before a court in the middle of the holiday, which, in terms of timing, is quite suspicious because it looks as though it was done, sort of—to sort of—to increase the kind of—keep them under the radar, if you like. NERMEEN SHAIKH: Clara Gutteridge, can you talk about the significance of them having been picked up in Djibouti, which is a long-term close ally of Washington and home to Camp Lemonnier, a key U.S. military base in Africa and also the hub of counterterrorism operations there and drone attacks? CLARA GUTTERIDGE: Right, Djibouti hosts a major U.S. military base called Camp Lemonnier, which is the headquarters of Operation Enduring Horn of—Operation Enduring Freedom–Horn of Africa and AFRICOM, which is the U.S. Africa Command. It has long been associated with renditions and secret detentions, going back to at least 2002. And over the past few years, it has very, very quietly become the largest hub of U.S. drone operations outside Afghanistan, so it’s really a key location for the United States in its war on terror both in Africa and Yemen, because of course it’s just across the water from Yemen. NERMEEN SHAIKH: Ephraim Savitt, can you tell us a little about your client, Mohamed Yusuf, how you came across the case, what you know about how he’s been treated since he’s been in U.S. custody? I came across the case because I was appointed by the court in the Eastern District of New York to represent this particular defendant. And his co-defendants, the two other detainees, also received lawyers that were appointed by the court. At present, now that we’re under the court’s jurisdiction, he is being treated humanely, he’s being treated well. But that was not always the case. In fact, he was arrested, together with his two co-defendants and others in Djibouti, by Djibouti authorities. And they were not treated with kid gloves—let’s put it that way—initially. And at some point, American authorities got involved in interrogating these three men. So, things got better for them now that we’re no longer under the radar. AMY GOODMAN: Tell us who Mohamed Yusuf is, your client. EPHRAIM SAVITT: Mohamed Yusuf is a young man. He’s approximately 27, 28 years old. He’s of Somali descent. He comes from Sweden. He was a bus driver in Sweden at one point. And he comes from a very close-knit and supportive family. And Mohamed was one of the many people who were recruited, through websites, advertisements, as well as other approaches, to join the al-Shabab movement, as a revolutionary group, against what they considered the oppression of other African invaders in their country. AMY GOODMAN: They were fighting AFRICOM, the African troops? EPHRAIM SAVITT: There were fighting the African troops. It is a religious-based organization. Mohamed joined the organization. AMY GOODMAN: Why does the U.S. consider it a terrorist organization? AMY GOODMAN: You’re saying your client was or the group was? EPHRAIM SAVITT: My client was not involved in anything having to do with terrorism. The group, according to reports, was involved in terrorism. There are some other reports that they put a price on the president’s head based on a number of sheep and a number of camels, which seems a little odd, but it doesn’t seem like a very serious threat. My client was a combatant in Somalia, in southern Somalia, and so were his co-defendants. And they were involved in military operations. There is no allegation, either officially or even unofficially, as I understand it, in my discussion with prosecutors, that they were in any way involved in targeting, and certainly or attacking American interests or American personnel. NERMEEN SHAIKH: So, a couple of things: First, you said that your client, Mohamed Yusuf, was not treated with kid gloves. NERMEEN SHAIKH: What kind of treatment precisely was he subjected to, number one? And number two, given what you’ve said, why is your client being tried in a U.S. court? AMY GOODMAN: And where was he being held then? EPHRAIM SAVITT: He was being held in a Djibouti prison. EPHRAIM SAVITT: By Djibouti authorities. He was arrested, together with his co-defendants, in an apartment in Djibouti. There were no Americans involved in that initial rough treatment. He made certain statements to the Djibouti authorities. And after that point, agents of the FBI, agents of other agencies, who did not identify themselves very clearly, did interrogate him. But they did so gently. On the other hand, the Djibouti people who slapped him around were seated in the same room with their arms crossed against their chests. So it was quite clear that these Djibouti police were proxies for the American authorities. AMY GOODMAN: When was he held there? When did his family lose contact with him? EPHRAIM SAVITT: His family actually lost contact with him sometime in 2008 when he was recruited to join the al-Shabab insurrection in Somalia. He was arrested sometime in the beginning of August this past summer. He was held incommunicado. Nobody knew about his existence until mid-November, when he was brought into the Eastern District of New York, and I and my fellow counsel, Harry Batchelder and Susan Kellman, were appointed to represent the three defendants. You asked the question as to why he’s being prosecuted in a Brooklyn federal courthouse, and that’s an excellent question. I don’t have a good answer for that. These are folks who were involved, for better or for worse, in a military campaign in eastern Africa. Now they’ve become criminal defendants in the Eastern District of New York. Their first and only contact with the Eastern District or with the United States is when they were brought here in chains and under an accusation of being terrorists. They never targeted civilians. They never hurt civilians. I don’t even know if they were able to hurt any of the enemy soldiers. They have no idea about that. But they were combatants, that’s true. NERMEEN SHAIKH: Clara Gutteridge, before we conclude, can you talk about the significance of John Brennan’s nomination as CIA chief? This is someone in 2005 who said that renditions were an absolutely vital tool of U.S. intelligence. CLARA GUTTERIDGE: Thanks. It’s extremely worrying to me that John Brennan is going to be the CIA chief, and the reason is this. As Obama’s chief counterterrorism adviser, he has in many ways been the architect of the drone program as we know it. He’s also been responsible for something possibly even more sinister, which is—which will probably be Obama’s legacy with respect to the war on terror. And that is that what was previously a set of ad hoc practices that were, you know, arguably developed in the heat of the moment after 9/11, in the months and years following that, under Obama have become systematized and bureaucratized. And what we have with these systems that Obama and Brennan have marshaled through is a kind of concretization of this idea that the United States is perpetually and indefinitely at war. And everything that we’re seeing with these renditions and secret detentions and drone attacks is something that flows from that. So, whilst the United States perceives itself to be perpetually at war, these kinds of activities will go on. People, like these three defendants, will be regarded as being within the jurisdiction of the United States and being the enemies of the United States. There will be no space for reparations for people that have been wronged, that have been tortured, that have been wrongfully rendered. AMY GOODMAN: Clara Gutteridge, we’re going to have to leave it at that, director of Equal Justice Forum, and Ephraim Savitt, lawyer representing Mohamed Yusuf. We want to thank you both for being with us. 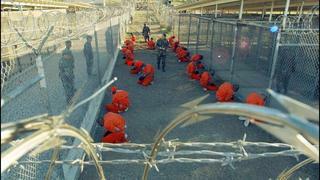 4 Years After Vow to Close Gitmo, Why Has Obama Signed NDAA Bill Barring Transfer of Its Prisoners?